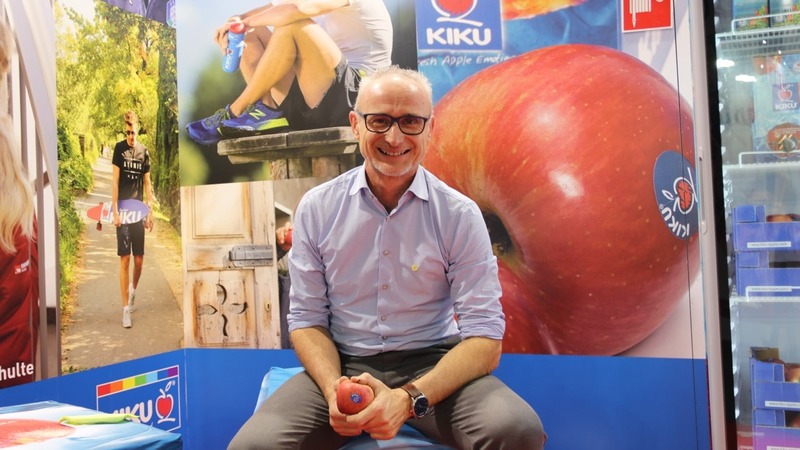 At the recent Interpoma 2018, held in Bolzano in Italy on November 15–17, Produce Report had the opportunity to interview Dr. Jürgen Braun, CEO of KIKU GmbH, regarding his company’s mission to find and develop new apple varieties and bring them to consumers. The KIKU apple story began in 1990 when Luis Braun, an apple expert from South Tyrol, discovered a particular branch in a Fuji apple orchard while traveling through Japan. This branch led to the natural mutant KIKU8, which was found to develop a particularly attractive coloration when grown in South Tyrol. KIKU apples are among the sweetest apples currently available, with higher Brix levels than most other varieties, and have proved very popular with consumers in various markets. Nowadays KIKU is a variety management company specializing in improved Fuji, Gala, Golden, and Red Delicious varieties, as well as branded apples such as the snack apple ISAAQ and the red-fleshed Red Moon variety, through partnerships and collaborations with growers around the world. At present, there are approximately 2000 hectares of KIKU apples being grown globally, including in Europe (600 ha), the U.S. (500 ha), South Africa (800 ha), South America (100 ha), and New Zealand (150 ha). Dr. Braun explained that KIKU’s philosophy is to search for extraordinary varieties of apples from around the world, with a focus on finding robust varieties with good genetics that can be grown in an efficient and sustainable manner: “It’s simply about having responsible farming and much more sustainable farming. So that’s our big vision for the company, and that’s a very concrete focus we have and that’s how we choose our new varieties.” Promising varieties with good flavor, appearance, and storage characteristics are then tested in a variety of locations, climates, and growing conditions around the world in an effort to obtain the best results for commercialization. One recent success for KIKU, in collaboration with the French nursery Escande, has been the Red Moon brand of red-fleshed apples, which culminated from 20 years of effort to obtain a red-fleshed apple that tastes good. Red-fleshed apples contain high levels of vitamin C as well as anthocyanins, the antioxidant pigments responsible for the red color. A new company, Red Moon GmbH, was founded to further develop these varieties, and 100 hectares have been planted in France and Italy. This year approximately 1000 tons of Red Moon apples were harvested, all of which have now been sold, reflecting the growing desire of consumers for healthier and more nutritious foods. As these are a niche and premium product, they fetch a higher price that is good for growers as well. The good storage characteristics of Red Moon apples allow them to be stored for one or two months after harvesting to let the acidity decrease and Brix sugar levels increase, until they are ready for eating. At present, approximately three-quarters of the harvest are used for fresh consumption, while the remaining one-quarter that exhibits russeting, a common occurrence with red-fleshed apples, is used for juices and other products, although more and more growers are moving toward growing specifically for juices and ciders. These Red Moon apples are being marketed under the slogan “Surprise Inside”, reflecting the reaction of consumers when they see the interior of a red-fleshed apple for the first time. Another popular variety is ISAAQ, a naturally small and robust apple that is being sold as a healthy and convenient snack, such as in vending machines, cinemas, and airline catering. With these and its other varieties, KIKU is aiming to increase the popularity of apples with consumers and make apples fashionable and popular once more. Part of this involves using brand ambassadors such as athletes and engaging in point-of-sale promotions to highlight to consumers the numerous advantages of apples. Dr. Braun explained that such efforts are increasingly necessary in an industry where the growers of other fruits are doing a lot more to promote their products. Another aspect is focusing on transformed products such as healthy juices containing 100% apple juice with no added sugars, water, or preservatives, to create value-added products that are more profitable for growers and cater to the demand from consumers for healthier foods and beverages. Dr. Braun went on to explain that apple growers in South Tyrol are typically organized into marketing cooperatives of hundreds of growers, and KIKU enters into licensing agreements with these cooperatives that grant individual growers the possibility of buying the trees and bringing the fruit to market. These licensing agreements include clear guidance for the growers on how best to grow the specific varieties based on their own research and tests, as well as quality standards in terms of both exterior and interior characteristics, to ensure that a high-quality and homogeneous product reaches the end consumer. KIKU then collaborates with the marketing cooperatives to invest in promoting the product to the consumer at the point of sale. Ultimately, this creates value for everyone along the supply chain and leads to loyal consumers and long-term success.